These poor man’s cookies are an old family recipe – spiced bar cookies with plump raisins and chopped walnuts. These poor man’s cookies (actually bar cookies!) is a recipe that my great Aunt has been making for as long as I can remember. It’s her “signature dish”. Well, one of a few. She also makes a killer Jello that has baby food in it (secret ingredient!) and a mean broccoli casserole. 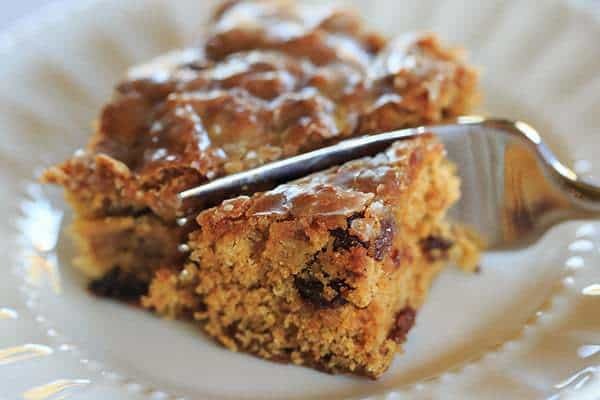 As you can see, this is not a cookie, but rather cookie bars! 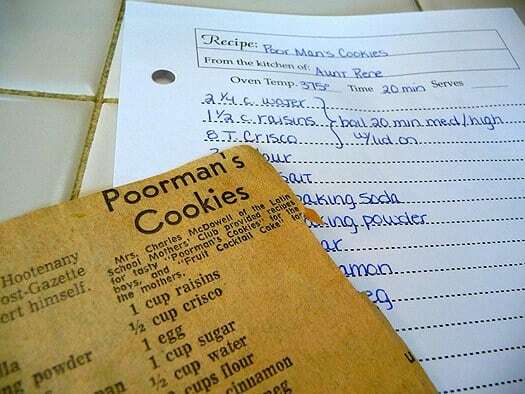 I always wondered about the name and the recipe’s origin, and then when going through a ton of my grandma’s old recipes, I found a yellowed newspaper clipping of a recipe for Poorman’s Cookies, which was nearly identical to my aunt’s, save for a few quantity changes. There wasn’t an explanation in the clipping about the origin of the recipe, so I am taking this for what it is – a beloved old-fashioned recipe. 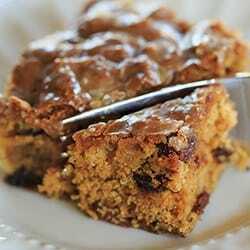 The preparation of this cake starts with boiling the water, raisins and shortening for 20 minutes. Doing this results in raisins that are nice and plump, and water and shortening that have boiled down to a syrup. When this mixture is first added to the dry ingredients the batter will have the consistency of paste, but don’t worry, once the eggs are added the batter takes a familiar, cookie dough-type texture. 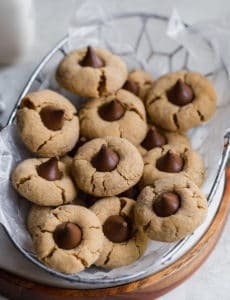 We used to eat these in true bar form – on Sundays when my aunt would make these, everyone would wander in and out of the kitchen, poor man’s cookie in hand. You could definitely cut larger pieces and serve them with a fork as a simple piece of cake. I often forget what a recipe FEELS like until I smell it after years of going without. When I took these out of the oven last week, I was overcome with the smell of my aunt’s kitchen and, with it, Sunday dinners at my grandma’s house. I love recipes that make you feel as cozy as your favorite fleece blanket, and these poor man’s cookies definitely fit the bill. I need to make them more regularly! These poor man's cookies are an old family recipe - spiced bar cookies with plump raisins and chopped walnuts. 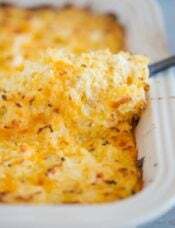 Preheat the oven to 375 degrees F. Grease a 9x13 baking pan. Combine water, raisins, and shortening in a medium saucepan. Boil over medium heat, covered, for 20 minutes. Remove from heat, remove the lid, and let cool for 10 minutes. 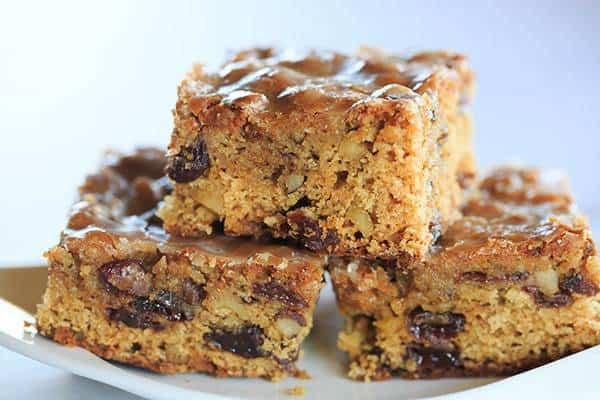 While the raisin mixture is boiling, whisk together the flour, sugar, baking soda, baking powder, salt, cinnamon, nutmeg and cloves in a large bowl. Pour the slightly cooled raisin mixture over the dry ingredients and stir with a wooden spoon until mostly combined and moistened (the batter at this point will have the consistency of a paste). Add the beaten eggs and again stir with a spoon, until thoroughly combined. Stir in the chopped walnuts. Spread the batter into the prepared pan and bake for 25 to 30 minutes, until deeply browned and a toothpick inserted into the center comes out mostly clean with some moist crumbs attached. While the cookies are baking, prepare the glaze by whisking together the powdered sugar and warm water in a small bowl. 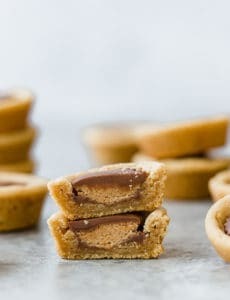 As soon as you take the pan out of the oven, drizzle the glaze over the cookies and quickly spread into an even layer. Cool to room temperature before serving. Store leftovers in an airtight container at room temperature for up to 4 days. Note: You can substitute unsalted butter for the vegetable shortening. 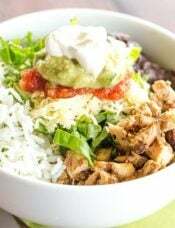 This recipe was originally published June 15, 2009. This recipe does not make bars. It makes spice cake. It even says it in the web address! Pay no attention to the picture, which is what I wanted to make. You will end up with a dark spice cake that is not chunky on top. Disappointed. This “cookie” is actually a cake! I was expecting bar cookies, but it was obvious there is WAY too much liquid. Is the amount of liquid correct? Next time I make these, I’ll use only 3/4 cup of water and hope I get a bar cookie! The “cake” edges were very tasty and what I was expecting. I have made this cake many times and everyone just loves it, as do I! The only change I make is I make a cream cheese frosting which takes it over the top!! Wasn’t this recipe originally listed as Old Fashioned Spice Cake? Yes, but I decided to give it the name my aunt always used for it. I made these exactly as called for in this recipe and they turned out wonderful. I did have to make 1/2 more glaze for the top but otherwise followed to a tee. I took them to an office luncheon and they were very well received. Mine looked as pretty as the picture up above. Wish I’d taken a picture. I will make these again. My grandma always made a poor man’s cake that was similar but not glazed every holiday. She baked the layers in round cake pans and stacked them like a layer cake with no frosting. It was so good and I always remember her cracking walnuts to add to the cake. 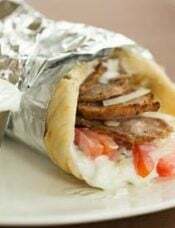 Whenever you would leave her house she would wrap a small slice in plastic wrap and send it home in a paper lunch bag for breakfast the next day. 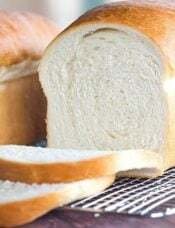 What I wouldn’t give to have one of those sweetly wrapped slices for tomorrow’s breakfast. Hi Michelle, I no longer have it, but I believe my mom does. I’ll see if she can dig it up! I google everything! So I googled these cookies and found the below info. I love the history of food! 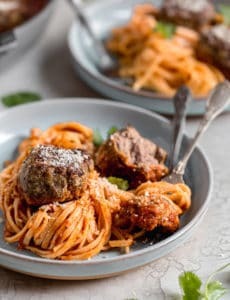 Thanks Michelle for posting this recipe! Oh my gosh! I haven’t thought about this recipe in years! give me her recipe and I’ve shared it with others many times since then. recipe. Thanks for bringing back a sweet memory! As soon as I saw the title of the post I knew exactly what the recipe was! These are some of my favorite “cookies”. I like the fact they are not wet looking like so many bar cookies. 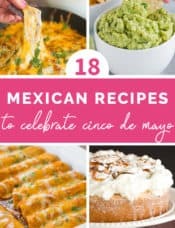 I have copied the other recipes from other posters as well. Every now and then a certain food smell propels me back to my Grandmothers’ kitchen. She was an amazing cook and could take a few ingredients and make them into delicious meals. Thanks for the memory jog. This is my father’s favorite cookie. I make it for him at Chrismas every year. I use my aunt’s recipe, which is the same as the one posted my Cat S. I might need to try this one out now and compare the two ? The one Cat posted seems to be the same one I see everywhere else… I’m not sure where my aunt got her recipe! That is so wonderful that you have the newspaper clipping! I have a lot of those from family members, too. These look so moist and yummy! 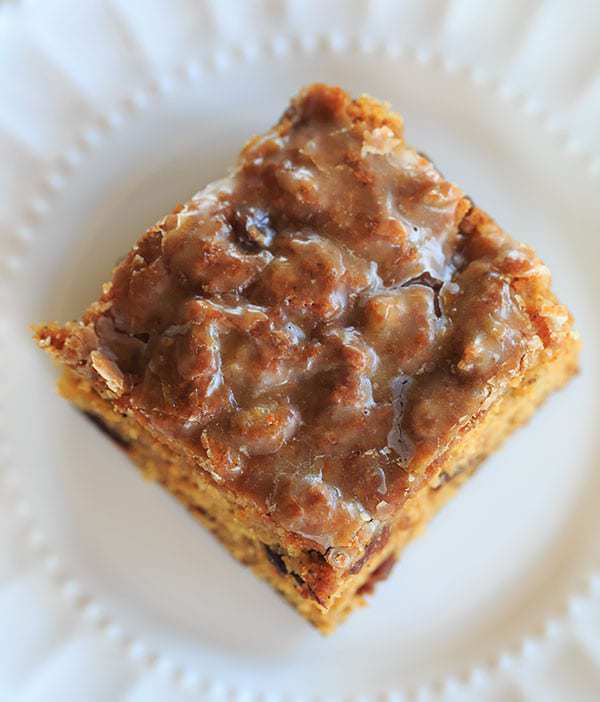 Pingback: Elegant Cakes – Oatmeal-Raisin Snack Cake with Cream Cheese Frosting + Quaker Oats GIVEAWAY! In small pan, cook raisins and water for 4 minutes. Turn heat off, stir in margarine until melted, let cool to room temperature. Mix/beat egg into dry ingredients, then stir in raisin mixture. Mix until smooth. Grease a 9″x13″ pan and pour mixture into pan. Bake at 350 degrees F for 30 minutes, until a toothpick inserted comes out clean. Ice with a thin water and powdered sugar glaze while still warm. Mix together a cup of powdered sugar with enough warm water to make a mixture slightly thicker than milk. 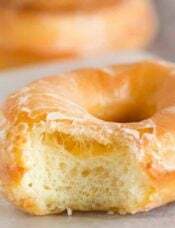 (May add a bit of vanilla flavoring and/or a half teaspoon of melted butter.) Spread while cookies are warm.